Life hacks are tricks, strategies, and not-so conventional methods used to perform a task or achieve a goal. It’s supposed to increase productivity by cutting the time normally allocated to perform the task in half. And there are hundreds of life hacks that cover all aspects of life including, yes, cleaning your home. Here are some of the best tried and tested home hacks that’ll make you wish you learned them sooner. 1. Descale a kettle with vinegar. After some time a water kettle gets lined with nasty looking mineral deposits inside. Clean it off with a cup of vinegar mixed with water or just enough to cover the scaling. Bring to a boil and allow the mixture to melt the stains off. Rinse off thoroughly with water. 2. Use toilet paper tube to make a custom fit nozzle for the vacuum. One of the most powerful tools and a favorite around the house is the vacuum. But with the limited nozzles that come with it, it’s difficult to find one that would perfectly clean all sorts of tiny corners and spots around the house. You can use a toilet paper tube as a nozzle by attaching one at the end of a vaccum’s tube. You can then bend or fold it to fit the tiny area you want to clean. 3. Get rid of hard water stains with vinegar. Hard water stains, the ones in the bathroom—stuck on the faucet, the bath tub, or the shower head can be an eye sore and are hard to remove. Try pouring vinegar onto a paper towel, wipe the hard water stain with it, leave on for a few minutes, and then wipe with a dry towel to see the area sparkle. 4. Remove toilet bowl stains with an old pumice stone. Ditch your stinky chemicals and get one of these instead. A pumice stone, yes the ones we normally use to scrub our feet with, works like magic on porcelain toilet bowls. Submerge the pumice stone in water for a few minutes, spray the area to be cleaned with water, and then scrub away. It can be used to scrub off that pesky toilet bowl rings and other stains. 5. Clean silver with baking soda, foil, and hot water. Bring a pot of water to a boil, add in a crumpled piece of aluminum foil, then add half a table spoon of baking soda. You can dip silverware like spoons, forks, and silver cups into the mixture for a few seconds to melt the stains. 6. Cut through burnt-on grease in the oven with baking soda and vinegar. Dab a wet cloth onto baking soda and wipe all over the insides of your oven. Leave the water-baking soda mixture on the surface for a few minutes. Spray with vinegar and then wipe off. 7. Let the blender clean itself by blending water and soap. Time to put an end to shoving your hands down to reach below and in between the blender’s blade. When you’re done blending make clean up as easy as pouring half a cup of warm water and a few drops of dish washing liquid. Put the blender back on its base and turn it on. This will basically let the blender clean itself. Rinse off and air dry. 8. Clean stainless steel kitchen appliances with alcohol and olive oil. Ever struggled with a stainless steel appliance in the kitchen that’s almost always covered in oil smudge and finger prints? Water just might not do the trick so you need to use something that’ll cut through the sticky oil like a pro. 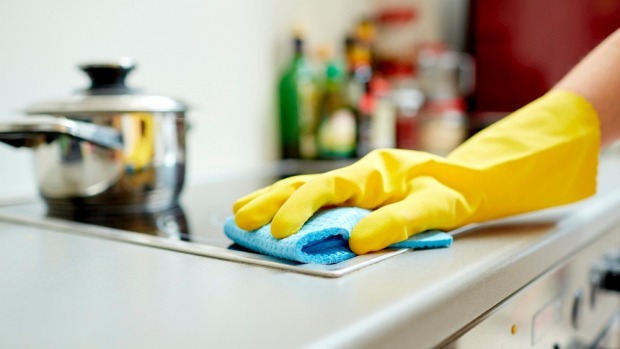 Pour a small amount of alcohol onto a cloth and wipe away sticky oil and fingerprints on stainless steel appliances. You can do this once a week. But to smudge proof your appliance and get rid of scratch marks you can apply a very thin layer of olive oil once a month. 9. Clean burnt iron plate with paracetamol. Time to put an end to that sticky mess you’re making while ironing clothes. Plug the iron and set it at low, then using a pair of tweezers or anything you can use to hold on to the paracetamol, scrub the bottom of the iron plate with the tablet. Watch the sticky goo melt away. You can wipe this with a clean dry cloth after. 10. Use sticky tape to pick up crumbs. Hate having to bring out and stow away a vacuum cleaner or the trusty broom so many times a day to remove crumbs that your children keep leaving everywhere? Try having a sticky tape on hand to pick up small crumbs on the floor. Cut a small piece and lightly dab on the floor or any surface (careful not to press it too much it could stick to the surface itself) to pick up small particles.